It is how you bring it out to serve the country that makes you different. Hats of to Kavi Pradeep for effectively protraying the feelings Common Indians have for those Shahids. But do young men and women have a monopoly where love is concerned. An award, Kavi Pradeep Samman, has also been constituted in his memory. Almost everyone had fought to the last round and killed many more enemy soldiers. ऐ मेरे वतन के लोगों, तुम खूब लगा लो नारा ये शुभ दिन है हम सबका, लहरा लो तिरंगा प्यारा पर मत भूलो सीमा पर, वीरों ने है प्राण गवाये कुछ याद उन्हें भी कर लो, कुछ याद उन्हें भी कर लो जो लौट के घर न आये, जो लौट के घर न आये ऐ मेरे वतन के लोगों, ज़रा आँख में भर लो पानी जो शहीद हुए हैं उनकी, ज़रा याद करो कुर्बानी जब घायल हुआ हिमालय, ख़तरे में पड़ी आज़ादी जब तक थी साँस लडे वो, फिर अपनी लाश बिछा दी संगीन पे धर कर माथा, सो गये अमर बलिदानी जो शहीद हुए हैं उनकी, ज़रा याद करो कुर्बानी जब देश में थी दीवाली, वो खेल रहे थे होली जब हम बैठे थे घरों में, वो झेल रहे थे गोली थे धन्य जवान वो अपने, थी धन्य वो उनकी जवानी जो शहीद हुए हैं उनकी, ज़रा याद करो कुर्बानी कोई सिख कोई जाट मराठा, कोई गुरखा कोई मद्रासी सरहद पर मरनेवाला, हर वीर था भारतवासी जो खून गिरा पर्वतपर, वो खून था हिन्दुस्तानी जो शहीद हुए हैं उनकी, ज़रा याद करो कुर्बानी थी खून से लथपथ काया, फिर भी बंदुक उठाके दस दस को एक ने मारा, फिर गिर गये होश गँवा के जब अंत समय आया तो, कह गये के अब मरते हैं खुश रहना देश के प्यारों, अब हम तो सफ़र करते हैं क्या लोग थे वो दीवाने, क्या लोग थे वो अभिमानी जो शहीद हुए हैं उनकी, ज़रा याद करो कुर्बानी तुम भूल ना जाओ उनको इसलिए कही ये कहानी जो शहीद हुए हैं उनकी, ज़रा याद करो कुर्बानी जय हिंद, जय हिंद की सेना जय हिंद, जय हिंद की सेना Ai mere watan ke logon, tum khub laga lo naara Ye shubh din hai ham sabaka, lahara lo tirnga pyaara Par mat bhulo sima par, wiron ne hai praan gawaaye Kuchh yaad unhen bhi kar lo, kuchh yaad unhen bhi kar lo Jo laut ke ghar n aye, jo laut ke ghar n aye Ai mere watan ke logon, jra ankh men bhar lo paani Jo shahid hue hain unaki, jra yaad karo kurbaani Jab ghaayal hua himaalay, khtare men padi ajaadi Jab tak thi saans lade wo, fir apani laash bichha di Sngin pe dhar kar maatha, so gaye amar balidaani Jo shahid hue hain unaki, jra yaad karo kurbaani Jab desh men thi diwaali, wo khel rahe the holi Jab ham baithhe the gharon men, wo jhel rahe the goli The dhany jawaan wo apane, thi dhany wo unaki jawaani Jo shahid hue hain unaki, jra yaad karo kurbaani Koi sikh koi jaat maraathha, koi gurakha koi madraasi Sarahad par maranewaala, har wir tha bhaaratawaasi Jo khun gira parwatapar, wo khun tha hindustaani Jo shahid hue hain unaki, jra yaad karo kurbaani Thi khun se lathapath kaaya, fir bhi bnduk uthhaake Das das ko ek ne maara, fir gir gaye hosh gnwa ke Jab ant samay aya to, kah gaye ke ab marate hain Khush rahana desh ke pyaaron, ab ham to safr karate hain Kya log the wo diwaane, kya log the wo abhimaani Jo shahid hue hain unaki, jra yaad karo kurbaani Tum bhul na jaao unako isalie kahi ye kahaani Jo shahid hue hain unaki, jra yaad karo kurbaani Jay hind, jay hind ki sena Jay hind, jay hind ki sena. Hats off to Lata Mangheshkar. ! Kavi Pradeep was at his creative zenith when he wrote for the films Nastik 1954 and 1954. It's a most melodious and value based song by Lata Deedhi!! Retrieved on 10 November 2018. Kismet made box office history for its time by running for 3½ years in one theatre. The reel had to be rewound and the song was screened again and again. O people of my country went on to become one of the greatest patriotic songs of the country. Pradeep shifted to Bombay and wrote four songs for the film, all of which became very popular, and sung three of the songs himself. On hearing the song she was moved so much that she instantly agreed to sing the song on condition that Kavi Pradeep be present at the rehearsals. Happy Independence day to everybody! Raise all the slogans you desire, This is a great day for us all, Hoist your beloved tricolor, Par mat bhoolo seema par Eeeron ne hai praan ganvae Kuch yaad unhein bhi kar lo Kuch yaad unhein bhi kar lo Jo laut ke ghar na aaye Jo laut ke ghar na aaye But don't forget on the border, The brave did lose their lives, And remember each great soldier, Who did not return home ever, Ae mere vatan ke logon Zara aankh mein bhar lo paani Jo shaheed hue hain unki Zara yaad karo qurbaani O! He was survived by his wife and two daughters, Sargam Thaker and Mitul Pradeep, who later set up the Kavi Pradeep Foundation. Times of India 18 January 2002. The people of my country, Shout out as many slogans as you wish This is an auspicious day Hoist our beloved tricolored flag Par mat bhoolo seema par Viron ne hai pran ganvaaye But do not forget that the brave ones Have lost their life at the borders Kuchh yaad unhe bhi kar lo Kuchh yaad unhe bhi kar lo Jo laut ke ghar naa aaye Jo laut ke ghar naa aaye Spare a moment of thought for them Who did not return to their home Aye mere vatan ke logon Zara aankh mein bhar lo paani Jo shahid huye hain unki Zara yaad karo kurbaani O! This song was originally supposed to be sung by , due to a misunderstanding between composer and. Happy Independence day to everybody! Jab ant samay aaya to Jab ant samay aaya to Keh gaye ke ab marate hain Khush rahana desh ke pyaaron Khush rahana desh ke pyaaron Ab hum to safar karate hain Ab hum to safar karate hain When the final moment came on, They said they will die now, Be happy! Kavi Pradeep always believed in writing songs in simple words portraying a meaning fitting into the situation. Jay hind jay hind ki sena Jay hind jay hind ki sena Jay hind jay hind jay hind Victory to India! Jo shaheed huye hain unaki, Zjara yaad karo kurbaani. Jai hind Jai hind Jai hind Victory to India! Ramchandra, and sung by Lata Mangeshkar commemorating Indian soldiers who died during the Sino-Indian War. The popularity of his songs was due to his down-to-earth lyrics and simple language that was well understood by everyone. Though the song managed to pass through heavy censorship of the time, the British soon realised the true meaning of his songs and issued a warrant for his arrest. 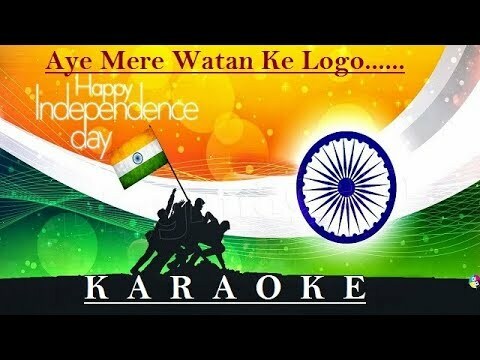 Lyricist s : Kavi Pradeep Aye Mere Vatan Ke Logon Lyrics from Independence Day Songs Aye mere vatan ke logon, tum khub laga lo naara Yeh shubh din hai ham sab kaa, lahara lo tiranga pyaara Par mat bhulo sima par, viron ne hai pran ganvaaye Kuchh yaad unhe bhi kar lo - 2 Jo laut ke ghar naa aaye - 2 Aye mere vatan ke logon, jara aankh me bhar lo paani Jo shahid huye hain unaki, jara yaad karo kurbaani - 2 Jab ghaayal huwa himalay, khatare me padi aajaadi Jab tak thi saans lade woh - 2, phir apni laash bicha di Sangeen pe dhar kar maatha, so gaye amar balidaani Jo shahid huye hain unaki, jara yaad karo kurbaani Jab desh me thi diwali, woh khel rahe the holi Jab ham baithe the gharo me, woh jhel rahe the goli The dhanya javaan woh aapane, thee dhanya woh unaki javaani Jo shahid huye hain unaki, jara yaad karo kurbaani Koyi sikh koyi jaat maratha - 2, koyi gurakha koyi madaraasi - 2 Sarahad pe maranewala - 2, har veer tha bhaaratavaasi Jo khun gira parvat par, woh khun tha hindustani Jo shahid huye hain unaki, jara yaad karo kurbaani Thi khun se lath path kaaya, phir bhee banduk uthaake Das das ko ek ne maara, phir gir gaye hosh ganvaake Jab ant samay aaya toh - 2, kah gaye ke abb marate hain Khush rahana desh ke pyaaro - 2, abb ham toh safar karate hain - 2 Kya log the woh diwaane, kya log the woh abhimaani Jo shahid huye hain unaki, jara yaad karo kurbaani Tum bhul naa jaao unako, iss liye kahee yeh kahaani Jo shahid huye hain unaki, jara yaad karo kurbaani Jay hind, jay hind ki sena - 2 Jay hind, jay hind, jay hind In Hindi Other 'Independence Day Songs' Songs: 1: 2: 3: 4: 5: 6: Get Weekly Movie Updates Want to suggest any changes to the lyrics of ' Aye Mere Vatan Ke Logon' from 'Independence Day Songs'? His songs were so popular that fans would see his movies repeatedly just to listen to his soulful songs. Almost synonymous to the song phir means again in Hindi , the reel would be rewound and played many times to satisfy public demand. Ae mere vatan ke logon Zara aankh mein bhar lo paani Jo shaheed hue hain unki Zara yaad karo qurbaani Tum bhool na jaao unko Is liye kahi ye kahaani Jo shaheed hue hain unki Zara yaad karo qurbaani You don't forget them, That is why I am reciting you the tale Jab ghayal hua himaalaya Khatre mein padi aazadi Jab tak thi saans lade woh Jab tak thi saans lade woh Phir apni laash bichha di When injured was the Himalayan might, Our freedom was in jeopardy, Till their last breath did they fight, And then laid their dead body, Sangeen pe dhar kar maatha So gaye amar balidaani Jo shaheed hue hain unki Zara yaad karo qurbaani Resting their head on the soil, Sacrificed and slept immortal, For those who martyred on ice, Remember their great sacrifice! This forced Kavi Pradeep to go underground to avoid arrest. 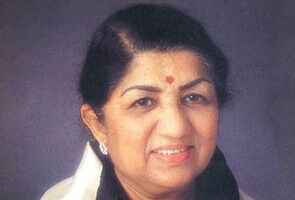 It was while Lata Mangeshkar was rendering the song that the Prime Minister of India, , was moved to tears. Just move your mouse on the stars above and click as per your rating. 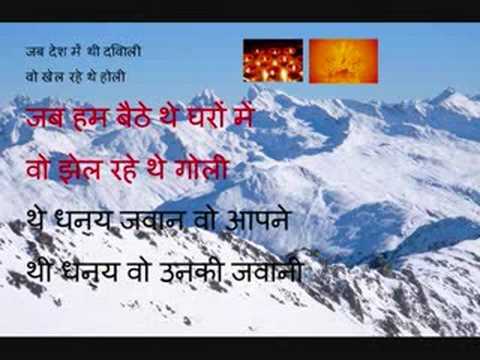 Jo khoon gira parvat par Woh khoon tha hindustaani Jo shaheed hue hain unki Zara yaad karo qurbaani The blood that stained the mountain, That blood was that of an Indian, For those who martyred on ice, Remember their great sacrifice! Of the 14 survivors, nine were seriously wounded. De vo phir apanii laash bichhaa dii sa. Story if a victory which many beleived to be a defeat. Dii aazaadii jab tak thii saa. . 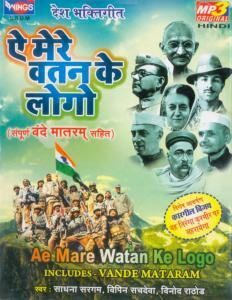 The song spreads a positive feeling and inspires us to do the best for our nation under any crcumstance. Nvaa ke jab ant-samay aayaa to kah gaye ke ab marate hai. Sad some of those who cried when listening to Lata's soulful rendition on 27 Jan 1963 were directly or indirectly responsible for the inadequacies of Indian Army. He was made the Rashtrakavi, Poet Laureate , and came to be known as, Kavi Pradeep In 1997, he was honoured by India's highest award in Cinema, the for Lifetime Achievement. However he managed to prove his detractors wrong with films Talaaq, a starrer and 1959 starring , and. Don't you ever forget their glory, So I narrate this noble story, For those who martyred on ice, Remember their great sacrifice! Thi khoon se lath-path kaaya Phir bhi bandook uthaake Dus dus ko ek ne maara Phir gir gaye hosh ganva ke With blood their body was drenched, Yet they lifted their rifle and aimed, One killed tens of the enemy, Then fell down unconsciously. It was written by Kavi Pradeep and composed by C. The song was supposed to warn the Axis powers, but the Indian public understood the real meaning of the song. Jab desh mein thi diwali Woh khel rahe the holi Jab ham baithe the gharon mein Woh jhel rahe the goli The dhanya javaan woh aapane Thi dhanya woh unki javaani Jo shaheed When the country celebrated Diwali, They played with their blood the game of Holi, When we were sitting safe at our homes, They dealt with deadly bullets and bombs. He continued to show his brilliance in 1975, when the movie was released. One estimate of Chinese casualties is close to 500 killed and wounded. Ramchandra was unsure whether Mangeshkar would agree to sing, so Kavi Pradeep began the task of convincing her to hear the song. It's a most melodious and value based song by Lata Deedhi!! Blessed they were those soldiers, Blessed were their youths, Koi sikh koi jaat maraatha Koi sikh koi jaat maraatha Koi gurakha koi madaraasi Koi gurakha koi madaraasi Sarhad pe marane vaala Sarhad pe marane vaala Har veer tha bhaaratvaasi For those who martyred on ice, Remember their great sacrifice! Kavi Pradeep was reportedly moved to compose the song by accounts of casualties of the war. Kavi Pradeep died at the age of 83 in Mumbai on 11 December 1998. He next film was 1940 produced by and directed by. I chose to write about all these different kinds of love. Please do so in the comments section below:. In backdrop of Indo-China war in 1962. His status as a nationalistic writer got immortalised for writing a daringly patriotic song Door Hato Ae Duniya Walo Move Away O Outsiders in India's first golden jubilee hit 1943 because he was forced to go underground to avoid arrest immediately after the film's release that invited the ire of British government. For a low-budget movie, it matched the collections of another Block Buster. 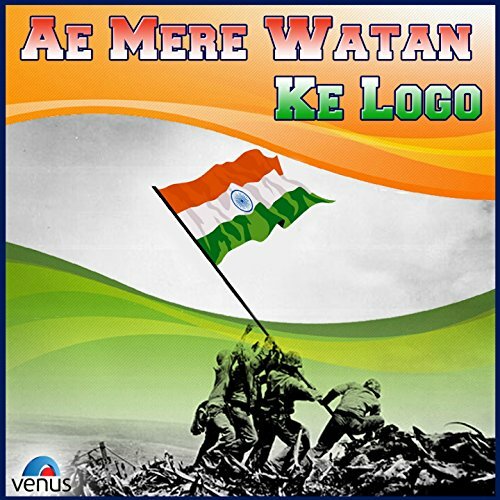 Ae Mere Watan Ke Logo Lyrics, Meaning & English Translation. He hypnotised the audience at kavi sammelans poet's gatherings with his inimitable style. Aren't there different kinds of love that between a mother and her children, between a father and his children, between a bhakt devotee and his deity, between a man and his motherland? Some Sikh, some Jaat and Maratha, Some were Gurkha or Madrasi, But each soldier who died on the border, Was a brave Hindustani. The song was famously performed live, by , in the presence of Prime Minister, at the , New Delhi, on Republic Day, 27 January 1963, and moved him to tears, and a copy of the soundtrack spool was also gifted to him on the occasion. Kavi Pradeep though, was adamant about having Lata Mangeshkar sing the song, as he felt that hers was the only voice that could do justice to the number. O beloved of the nation, We embark on eternal journey now, Kya log the woh deewane Kya log the woh abhimaani Jo shaheed hue hain unki Zara yaad karo qurbaani How great were those patriots, How great was their pride, Tum bhool na jaao unko Is liye kahi ye kahaani Jo shaheed hue hain unki zara yaad karo qurbaani For those who martyred on ice, Remember their great sacrifice! His first recognition came for his patriotic lyrics for the film 1940. The country was in strife with all national leaders in prison. Archived from on 19 January 2008.